Need more information about booking Home 583882 ? 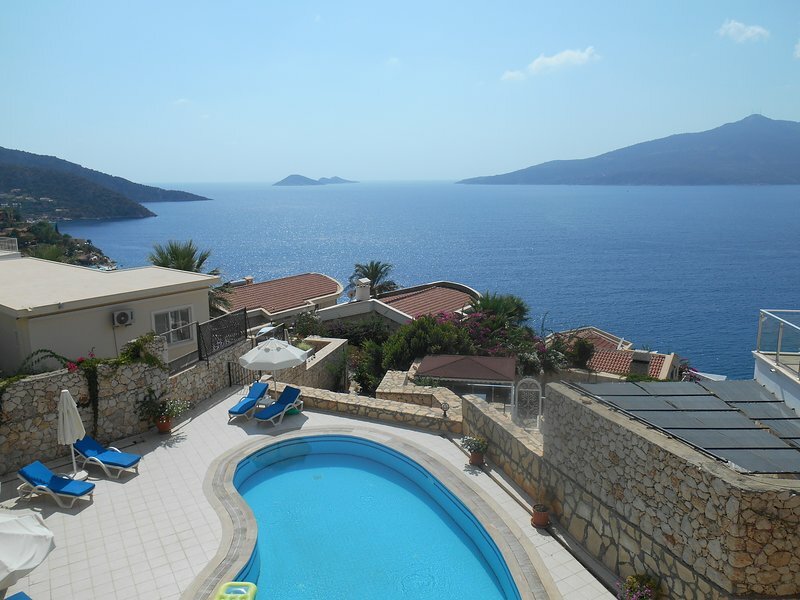 Situated in the charming, picturesque town of Kalkan on the Turkish Mediterranean coast is Oympos Haven, a lovely modern 2 bedroom apartment with stunning panoramic sea views from the lounge and balcony. Nestled into the hillside if offers an Idyllic peaceful location in the prestigious sought after area of Kormuluk, with the beach, marina and town centre a short stroll away. The shared pool with sea views has a shower, sunbeds, parasols and a shaded patio area. Palm Beach Club located in tropical gardens with a restaurant and amenities is conveniently accessed by steps, a 5 minute walk away, providing a free water taxi to the town and harbour. The apartment offers an ideal opportunity for a romantic, peaceful holiday in an idyllic setting, with local amenities nearby..
Internet access, safe, parking, weekly clean and linen change, guest meet and greet and 24 hour assistance provided. Local taxis from the town cost around 10 to 12 lira .. around £3.00. During the season the local Dolmus .. small buses operate frequently to Patara, Fethiye and Kas. They are very cheap and a great way to travel around the area. Various tour operators in the town also organise various excursions. We recommend Volume Travel as a reputable operator. Yusuf our apartment manager is available at any time for any problems or queries you may have. He speaks good English and is local too. Please don't hesitate to contact him if you need any advice or assistance during your stay. Please note the accommodation might not be suitable for small children as we have a balcony. The pool has a constant depth of 1 metre. Please do not smoke on the apartment terrace or use a BBQ. There is ample space on the top terrace of the building if you'd like to have a BBQ .. and stunning views too! Please be careful with suncream when sitting on the sofas or chairs .. thank you. You can get in touch with Alison (the owner) through the contact form on this page. Send Alison (the owner) an email through the contact form on this page. Alternatively, if there’s a phone number on this page, you can call them. How do I contact Alison (the owner)? If you’ve already booked, go to Manage your holiday booking to view Alison the owner's contact details or send them a message. Or send Alison (the owner) an enquiry through the Contact the owner/manager form if you’d like a quote or more info first. When you pay online through the Book your stay form, a booking request is sent to Alison (the owner). You’ll find out within 24 hours whether they’ve accepted - no money will leave your account before then. You can also request a quote from Alison (the owner) through the contact form. The owner will email you the total cost for your dates and a link to book and pay online. Use the Book your stay form to pay provisionally online. You can pay by credit/debit card or PayPal. Alison (the owner) will have 24 hours to accept the booking and no money will leave your account before then. Why can't I call Alison (the owner) before booking? You’ll need to contact Alison (the owner) to do this. Send them a message in Manage your holiday booking or through the contact form on this page. You can request to change the dates or number of people on your booking via the Manage your holiday booking page. To change your holiday dates use the Edit booking button. If you need to change the number of guests staying then send Alison (the owner) a message. If Alison (the owner) agrees, they’ll send you a revised quote outlining the changes. You can review and accept/decline this from the Manage your holiday booking page. You’ll have 48 hours to take action before the revised quote expires.